You’ve probably heard of something called keen-wa, and you’ve seen the word ‘quinoa’. What’s the difference? What’s the same? Why do people talk about them both? Why is it so popular? And how the hell do you cook quinoa? 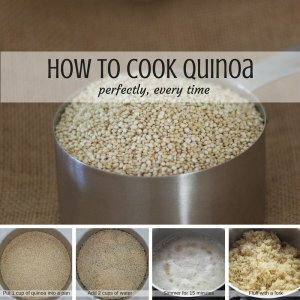 To cook quinoa is pretty simple. If you can boil water you can cook quinoa. And the bonus is it stores well. Cook a big batch and store it in the fridge for 4 – 5 days or in the freezer for up to 6 weeks. Firstly, what’s the difference between keen-wa and quin-o-a? Nothing, just the pronunciation. What’s the same? Everything else, it’s the same thing. Why is it so popular? Who knows! 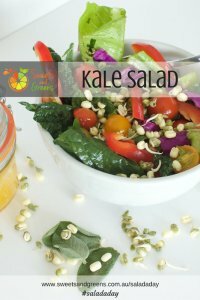 Probably an increase in the number of people eating plant based foods, it’s high in protein, easy to cook, it can be used in sweet and savoury dishes, it’s gluten free, it’s not a grain (it’s a seed that is eaten like a grain), it’s packed full of vitamins and minerals, and it’s had some great marketing. 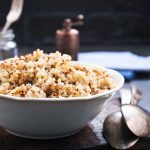 According to Nutrition Data every cup of uncooked quinoa contains 8g protein, 5g fibre, 58% RDA manganese, 30% RDA magnesium, 28% RDA phosphorus, 19% RDA folate and 15% RDA iron amongst other nutrients. Keep in mind, though, that you are unlikely to eat 1 cup of uncooked quinoa in a day. So how do you COOK QUINOA? The ratio is 2 cups of water for every 1 cup of quinoa. It’s easy to double it if you’re planning on storing it in the freezer. You can cook it in veggie broth, add salt and herbs, lemon and veggies etc etc, but I’m going to make this as easy as possible. Let’s start with the basics and worry about the fancy stuff later. Rinse the quinoa! It needs to be rinsed, otherwise you end up with a gritty substance, which isn’t very nice. Add 2 cups of water and 1 cup of dried quinoa to a saucepan. Reduce the heat to low so it’s still simmering. Cover with a lid and let simmer for 15 minutes. After about 15 minutes, the water should have been absorbed and the quinoa light and fluffy. Remove the lid and using a fork fluff it up. If you’re planning on storing it, let it cool, then add 1 cup to 3 separate freezer proof containers. How much does 1 cup of dried quinoa make? If your maths is any good you may have worked out that you’re storing 3 containers in the freezer, so 1 cup dried quinoa equals 3 cups cooked quinoa. What happens if you remove the lid after step 5 and it’s not quite right? If the quinoa is still hard and there’s water in the saucepan, continue cooking for another 5 minutes or so. If the quinoa is hard and there’s no water left, add another half cup of water and cook for another 5 minutes, repeat if necessary. If the quinoa is soggy after 15 minutes, then you’ve messed up. We all do it. But all is not lost. You don’t need to throw it away. You may have put too much water in the saucepan. What I’d do is drain the soggy quinoa and let it cool. Then cook up another cup using less water. When you’ve cooked both batches mix them together and you’ll hardly be able to tell that some of the seeds are too soft. The beauty of quinoa is you can mix it with anything. You can add it to salads, soups, curries, casseroles, muesli breakfasts, mushrooms, mashed potato, the list goes on. If you’re planning on adding it to other things you may want to store it in half cup containers so it’s easier to just use what you need. And, finally, where do I get quinoa from? You can also search my website for all of my quinoa recipes. Pour 1 cup quinoa and 2 cups water in a saucepan. Reduce heat and let simmer for 15 mins. 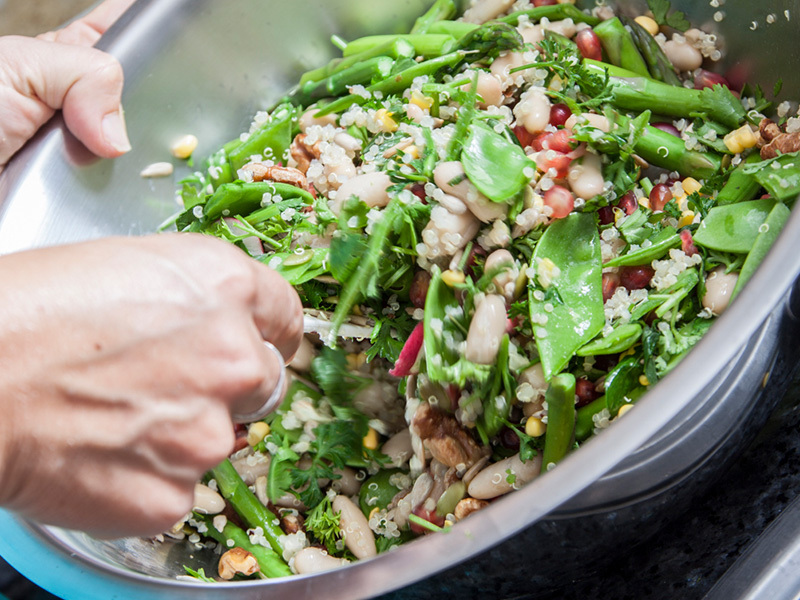 Cooked quinoa can be stored in the fridge for 4-5 days and in the freezer for 6 weeks.